Feeding soldiers during the Civil War was a very different process from the way contemporary soldiers are fed. Commissary departments gave soldiers uncooked rations of flour, salt, potatoes, cornmeal, beans, sugar, and dried or salted beef. These rations included very little vitamin C, which caused some soldiers to develop scurvy. This was a very dangerous disease that caused bleeding gums, discolored fingernails, and eventually death. In order to supplement their basic rations, both Federal and Confederate soldiers were expected to forage for food early in the conflict. While in enemy territory, soldiers often simply stole foodstuffs from local farms. This practice left many civilians without supplies and sometimes caused widespread hunger. Soldiers often went hungry too, especially in the south where shortages were more common. Before the war, a typical southern family might spend around ten dollars a month on food. By 1864, the same amount of food cost four hundred dollars or more. Sometimes soldiers hunted for fresh meat, or relied on the generosity of sympathetic locals for items such as milk or fruit. Soldiers in the Union army had access to "sutler stores," something like a traveling convenience store that followed the army. These stores stocked canned fruit, fresh meat and vegetables. As food shortages increased over the course of the war, many soldiers found sutler goods simply too expensive. Two of the most common foods for soldiers were flour-based crackers called "hardtack," and a cornmeal concoction called "Johnny cake." Federal soldiers were issued hardtack as part of their rations. This was, as the name suggests, rock hard crackers made from flour, salt and water. Soldiers often softened the crackers by crumbling them into coffee, or frying them with animal fat. Sometimes, hardtack was all a soldier had to eat for many days. Confederate soldiers did not receive hardtack as part of their rations. 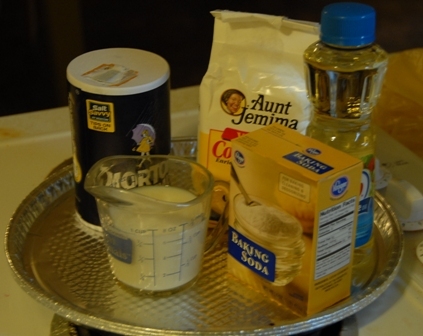 Instead, they used the cornmeal, milk, and salt to create "Johnny cake." This served the same purpose as hardtack because the cakes hardened quickly and could be easily transported. Project Notes: Parents and teachers should supervise children while using the oven. 2. Lightly grease a cookie sheet with butter or vegetable oil. 3. Mix all dry ingredients together in the mixing bowl. 4. Add all wet ingredients to the dry. 5. Mix together until the batter is very stiff. 6. Use a spoon to drop the batter onto the cookie sheet, very much like making "drop biscuits." 7. Bake for 20 minutes, or until the biscuits are lightly browned.